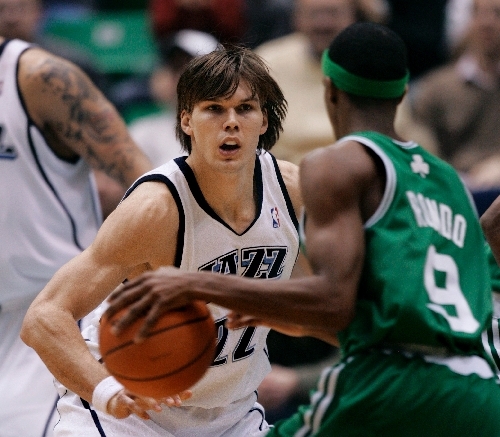 Lou Amundson, the former UNLV center who played for the Rebels from 2001 to 2006, has moved from town to town in his seven-year NBA career. Salt Lake City. Philadelphia. Oakland. Phoenix. Indianapolis. And now, Minneapolis. In 1972, Rick Barry wrote a book titled “Confessions of a Basketball Gypsy” that detailed his travels between the NBA, the old American Basketball Association and back to the NBA. Truth is, Barry wasn’t as much gypsy as he was opportunist. He was a future Hall of Famer who peddled his skills to the highest bidder. Lou Amundson? He’s a true basketball gypsy. The former UNLV center, who played for the Rebels from 2001 to 2006, has moved from town to town during his seven-year NBA career. Salt Lake City. Philadelphia. Oakland. Phoenix. Indianapolis. And now, Minneapolis. He’s not the most talented player, and he won’t be joining Barry in Springfield, Mass. But between his work ethic, his high basketball IQ and his ability to fit in, Amundson has carved out a nice pro career. He has made several million dollars, and his future is secure as he is already vested in the NBA’s pension plan. As gypsies go, Amundson is as good as you will find. Bill Bayno never coached Amundson at UNLV. That opportunity went to the late Charlie Spoonhour and Lon Kruger. But Bayno has had a chance to work with Amundson as an assistant on Rick Adelman’s staff with the Timberwolves. Amundson spent last season with Indiana thanks to Larry Bird, the Pacers’ president who loved Amundson’s hustle and high basketball intelligence. But when Bird left the organization after last season, Amundson lost an ally. And when the Timberwolves showed interest in the 6-foot-9-inch forward last summer, Amundson signed with Minnesota. Amundson said his nomadic career has allowed him to be coached by a lot of different people and play alongside a lot of players. He’s also managed to stay relatively healthy as a pro. At UNLV, Amundson often dealt with injuries and illness, which set back his progress. But other than a broken finger with Golden State in 2010, which limited him to 46 games, he has managed to avoid the injury bug during his NBA run. “I’ve spent a lot of time in the weight room in the offseason and during the season, and those are good preventative measures to avoid injuries,” Amundson said. To keep his mind sharp and to help him get away from any frustration he may have with basketball, Amundson writes and plays music, paints and plays Scrabble. He’s also trying to follow UNLV’s exploits as much as possible. He was excited to hear the Rebels won at San Diego State on Wednesday, and he occasionally talks to coach Dave Rice. Amundson, who led the Rebels in scoring (14.3) and rebounding (8.6) his senior year in 2006, could be wearing his seventh NBA uniform at this time next year. At age 30, he risks losing his job to a younger, less expensive player. According to his agent, Mark Bartelstein, Amundson is making the NBA veteran minimum of $1,069,509, and his deal with Minnesota is only for this season. “I always believed in myself and my skills,” Amundson said. “I believe I belong in this league, and you have to have confidence in yourself. I would love to have some consistency, but it hasn’t worked out that way. It’s hard, but you just adapt and you just persevere.